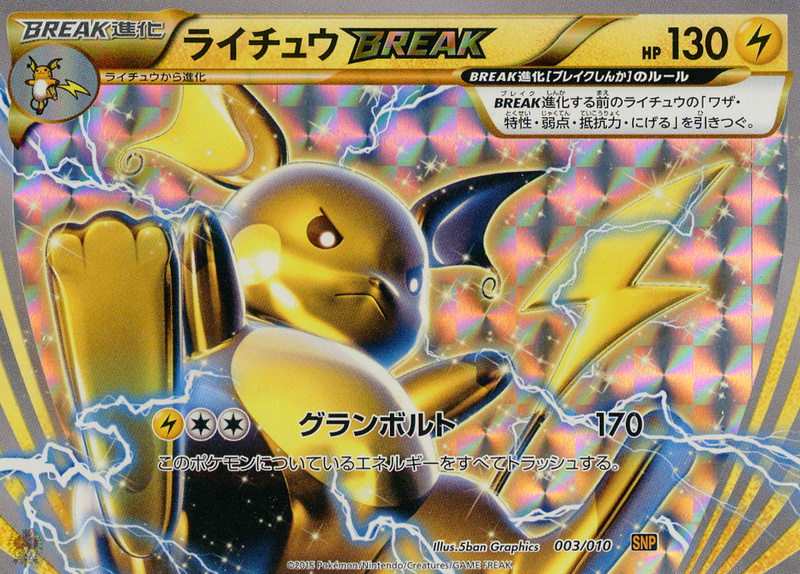 Notes: Our first BREAK era deck comes to us in the form of these two little 10 card packs, toting RaichuBREAK and NoivernBREAK as their star-runner cards. When the decks were first announced no one was really sure if they were going to be their own standalone small deck, or simply feature promo prints, like some later BREAK releases did. Instead a lot of us were pleasantly surprised to find they were standalones! Given how cheap these tiny decks are they’re pretty awesome, and while they only offer a small sampling of Pokemon with a fair few trainers, both reprint and new, they’re still pretty neat. The Raichu deck of course focuses on Raichu and it’s pre-evos, but sees support from a very cute Stunfisk as well. Each deck came with a special fold out poster all about the new BREAK mechanic, with play style guides written up for each card in the deck. You can see a full size, correct orientation scan of RaichuBREAK here. • This deck was released in Japan on the 26th of September 2015. • The SNP set logo and designation comes from the word Evolution (しんか/Shinka) and Pack. • These cards were assimilated into the English set BREAKthrough.